We are a family run business that provides a full range of quality auto service in Kansas City and Overland Park. Our state-of-the-art auto service and repair shops are conveniently located in Kansas City and Overland Park. Our certified auto service and repair technicians are very experienced and will diagnose, troubleshoot, repair, and fix car problems to a standard you can trust. Sallas Auto Repair has dedicated itself in providing our Kansas City and Overland Park customers with the highest quality auto service and repairs. Our experienced ASE-Certified auto technicians will provide top quality repairs to any of your car's systems - brakes, electrical, cooling/heating, fuel, suspension and engine. We are also ready to assist with your vehicle service and maintenance. Bumper to Bumper, we have you covered. Call the Courtesy Pick Up Hotline or Book an Auto Repair appointment online. We believe in preventative maintenance for your car. Be sure to check your manufacturer's recommended service schedule for your car, light truck or SUV. When auto service maintenance is needed, our shop will treat you and your vehicle with care and respect. We service vehicles of all makes & models: Honda, Toyota, Chevrolet, GMC, Nissan, Ford, Chrysler, Dodge, Volvo, Mazda, Saab, Audi, Subaru, Volkswagen, Cadillac, Lexus, Mercury, Lincoln, Kia, Jeep, Hyundai, Suzuki, Saturn, BMW & more. We work on regular maintenance auto services like oil changes and flushes, but also on major repairs & replacement for engines, brakes, power steering, transmissions, suspension, electrical, air conditioning, heat, tires, wheels, timing belts, water pumps, alignments, tune-ups & the list goes on! Not sure if we can do it? Call us at our Kansas City location or at our Overland Park location. Or, you can Ask An Expert any auto question you may have and we will do our absolute best to make sure your issue gets resolved. We know a quality oil change is critical in saving you money and keeping you safe on the road - that is our goal at Sallas Auto Repair and regular auto maintenance is part of the answer. So what is different about our oil change service? If you want to take advantage of oil change coupons, the next time you are in one of our Sallas Automotive locations, ask for a FREE Oil Change Coupon Card. Every time you have your oil changed at Sallas Auto Repair, bring your Oil Change Coupon Card along and we will stamp your card. When you have three oil change stamps, your next oil change is FREE! Just another way Sallas Auto Repair helps you save. An oil change is a part of any regular maintenance schedule for your car. Check your owner's manual and follow the manufacturer's recommendation. If it says change the oil every three months or 3,000 miles and you haven't traveled 3,000 miles in that time, change it anyway. The recommendations are generally much longer than that. For instance, Acura suggests changing the oil in some models every 7,500 miles or one year. You can get your oil change in Kansas City or Overland Park with complete confidence. Our qualified auto technicians will take great care of your vehicle while changing the oil and the oil filter. This not a basic oil change. We will make sure your car is properly taken care of. Our auto technicians in both our Kansas City and Overland Park locations don't simply change the oil -- they take the time to advise you of any other maintenance items or problems that may require attention. When you leave Sallas Auto Repair, you are assured that your vehicle is in a good, roadworthy condition. Oil is an essential lubricant in your engine. Without oil, the metal-on-metal friction creates so much heat that eventually the surfaces weld themselves together and the engine seizes. Oil undergoes thermal breakdown due to high operating temperature. When this occurs, the oil becomes less effective as a lubricant. And without a good lubricant, parts of the engine rub together and wear each other out. When you think of it, everyone knows if you drain the oil out of a car it is not going to travel any distance before the engine sizes. When you understand the breakdown in oil that occurs with heat, then you understand the need to change your oil. Air conditioning for your automobile helps you and your passengers stay cool and comfortable. Car air conditioning units work similar to air conditioning units for the home. The car AC unit takes in air, cools it down, and then takes all of the moisture out of the air to give a cooling effect inside of the car. Vehicles are equipped with air conditioning systems that work with the heating and ventilation systems to provide cool, dry air. What Happens When The System Breaks? These systems eventually wear out or break. We offer the best car air conditioning repair in Kansas City. Modern technology requires that only certified individuals check car air conditioning systems for the proper operation. At Sallas Auto Repair, our certified technicians perform preventative maintenance on car AC systems to ensure air continues to blow at a temperature cool enough to cool down the car and each passenger. We check your vehicle's system and provide any car air conditioning repair or maintenance to avoid these complications. If needed, we can recharge your air conditioning system using specialized equipment. Contact us today if you're looking for car air conditioning repair or recharging. Call in Kansas City or in Overland Park. When your car's check engine light comes on, it can be a frustrating experience since it can be caused by any number of reasons. Since modern vehicles have computer systems that control much of the car, the check engine light can be caused by a computer issue. Diagnosing a car's computer system can be a complicated process. At Sallas Auto Repair, we have the advanced diagnostic tools necessary to find the reason behind the light. There are some pretty common causes for the check engine light to come on. Without reading the car's computer, you won't be able to diagnose the problem, so it's best to have the actual reason diagnosed. Here are the most common reasons behind a check engine light. A loose gas cap can actually cause fuel vapors to escape from the car and confuse the fuel system. If your gas cap is loose or wasn't screwed on properly, tightening the gas cap can eliminate the problem. You may also want to check your gas cap for any cracks. The oxygen sensor is located in your car's exhaust and it carefully monitors the amount of oxygen remaining from your fuel after combustion occurs. Some fuels are considered "rich" meaning they have less oxygen left over than the typical ratio of air to fuel. "Lean" fuels have too much oxygen remaining after combustion. Both of these scenarios can negatively affect your vehicle and the environment. Your car's oxygen sensor monitors the ratio of air to fuel and makes adjustments to keep your car running efficiently. Over time, an oxygen sensor can stop reading correctly if it gets covered in oil ash. Typically replacing an oxygen sensor is not a costly repair (except in some European vehicles). However, if you do not have an oxygen sensor replaced in a timely manner, it can lead to a much more expensive repair by ruining your catalytic converter. The mass air flow sensor tells the computer how much fuel to add to the engine based on how much air is coming from the engine after combustion. Typically a mass air flow sensor reading can actually be caused by the car's air filter. If the air filter was not installed properly, or if it hasn't been changed in a while (you should have your air filter changed on a regular basis), it can give a false reading to the mass air flow sensor. It's important to have this issue inspected by a professional mechanic because a problem with your mass air flow sensor not only reduces your gas mileage, but it can also cause your car to stall out, leaving you stranded on the road. A failing spark plug can cause a misfire in your spark plugs, leading to less power in your car, sluggish performance, and ultimately it can damage your catalytic converter. If a spark plug is failing, your check engine light will typically blink on and off. Although a problem with your spark plugs mostly likely won't leave you stranded on the side of the road, it's important to have a spark plug problem corrected immediately. The bottom line regarding the check engine light is that it can be caused by a variety of items. The best thing to do is to have a professional hook up a diagnostic tool to your car's computer and inform you of the code. Don't let a check engine light go for too long without being checked. Call Sallas Auto today to have a specialist diagnose the reason your light came on. The brake system is probably the most important system in your vehicle. Brakes are a normal wear item for any car, so sooner or later they're going to need replacement. You never want your brakes to get to the "metal-to-metal" point, which usually means expensive rotor or drum replacement. If your car exhibits dragging brakes, squealing brakes, a pulsating brake pedal (with ABS not functioning), grinding brakes, a low brake pedal or pulling when braking, have it checked out by a qualified technician as soon as possible. For more information or to schedule an appointment, call Sallas Auto today at our Kansas City location or at our Overland Park location or schedule an appointment online. 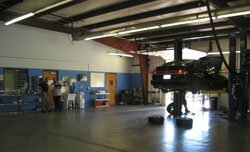 Ensuring that your car has the proper alignment has much more to do with steering your car straight. When your car's alignment is off, it can produce extra wear and tear on your tires, and we all know that tire replacement can be a big unexpected expense. It's also a good idea to have your alignment checked if it's been a while since you've had the car aligned. A car moves out of alignment just due to every day driving. If you've recently hit a big curb or have been in a little fender-bender, it's also a good idea to have your car's alignment checked. These types of activities put extra strain on your vehicle's suspension system and that is what causes your car to be out of alignment. If you live in the Missouri/Kansas area, due to the condition of our roads, we recommend having your alignment checked at least once a year. If you purchase your tires from Sallas Auto Repair, we offer a lifetime alignment package that includes checking the alignment once a year at no charge. You can trust the professionals at Sallas Auto Repair to get your car back into proper alignment. Schedule your appointment today! Sallas Auto Repair's tires for sale in Kansas City & Overland Park are outstanding! It doesn't matter what your tire needs are - you can count on the best. No where else can you find the combination of friendly employees, reliable repair & the convenience of our service - not to mention our Road Hazard Tire Warranty Plan. You don't have to rely solely on the tow company for a flat tire anymore! Sallas Auto Repair has the best service and selection of tires for sale in the Kansas City Metro area! We have great flat tire services, education and plenty of options when it comes to buying new tires. We are here for you every step of the way when it's time to replace your tires! When you're out on the roads and get a flat tire, call Sallas Auto Repair! We will come and get your car and fix your flat tire for you (If you're within a 30 mile radius of either our Overland Park, KS or Kansas City, MO auto repair shops). Now, that is service! Make sure to add Sallas Auto Repair as a contact in your phone! It's important to know when your vehicle needs new tires. Worn tires create a safety hazard, as they're more prone to flat tires and can create mechanical problems that require costly auto repairs. To avoid these unexpected expenses, make sure to monitor your tires and know when to replace them. To make it simpler, we've gathered our tips for How to Know When to Replace Your Tires. When you know you need to replace your tires, check out our quick tips for Buying New Tires. We'll help you select the right option from our inventory of tires for sale. Our service plans are conveniently available at both our Kansas City and Overland Park locations. Sallas Auto understands the importance of service plans when it comes to new tires! You never know what can happen. That's why we offer an outstanding plan for those who purchase and service their new tires with us! At Sallas Auto Repair, you can rest assured that your tires will be well taken care of so you're as safe as can be on the road. Not only do we inspect your tires every time you come into the store, we advise you on how much life they have left and the best way to maintain them, as well as the best tires available for your vehicle. Every tire we offer comes mounted & balanced by one of our experienced technicians for reliability. We're also proud to offer a 4 year Alignment option for $169.00 with every tire sold. Just ask our friendly Service Advisors about it! Sallas Auto Repair offers a nationwide road hazard insurance at both our Kansas City and Overland park locations. This tire insurance can be added to each new tire purchase to help protect your investment. This plan covers all of our tires for sale. Flat Tire Repairs for the life of the tires. Free flat tire change within 25 miles of either Sallas Auto Repair location. Mounting & Balancing of each tire after replacement or repair. Reimbursement for flat tires outside of 25-mile radius. Tire replacement/reimbursement outside of 25-mile radius of the Sallas Auto Repair locations. Covers any damage to tire such as hitting a curb, picking up a nail, or blowing tire out, etc. Vandalism to tire due to knife or ice picks, etc. After-market oversized wheels and tires. Only covers tires that are patched correctly (no plugs will be covered). Tires cannot be transferred from one vehicle to the next. Will not cover tires wearing out prematurely due to improper alignment, being knocked out of alignment, or lack of maintenance (regular balance and rotation). Flat tire repairs must be done with a patch and not a plug or the warranty will be void. For flat tire repairs, tires must be returned to Sallas if within a 10-mile radius of our store locations. Outside of this coverage customer can have tire fixed and send us the receipt, we will cut a check out of the main store and mail it to them within 3 business days. Up to a $20.00 reimbursement. We will come to the customer's home or business (within 20-mile radius), air up the tire, bring the tire or vehicle back to our shop, and repair the tire at no charge to the customer. Road Hazard Pro-Rating: Free replacement of tire up to 3-32nds of tread used. After 3-32nds of tread has been used, tire will be pro-rated at 10% of total sale price of tire per each 32nd used. Covers Mounting and Balancing of tire. If the vehicle is out of town and requires a tire replacement, the customer must bring in a copy of the repair bill with the 32nds of tread measured on the receipt. We will reimburse the customer according to our scale. We will not pay more than what we sold the customer the tire for if it is in the 3-32nds or less used range. After 3-32nds, we pro-rate the tire. When you tell most shops that your car is having transmission problems, they just tell you that you need to replace the whole transmission. In some cases there may be an electrical issue in the transmission and the repair cost for these items is significantly less than replacing the whole transmission. If someone tells you that you need to replace your transmission, get a second opinion. Transmission service may solve your transmission problems with less expense. A transmission is a hydraulic pump that basically shifts gears to propel the vehicle forward or in reverse. With proper maintenance and fluid, the transmission should last you 300/400 thousand miles. The key to keeping your transmission running that long is proper maintenance, flushing the fluid every 30,000 miles, and changing the transmission filter every 60,000 miles. If you tow with your vehicle on a regular basis, we recommend flushing the fluid every 15,000 miles. Most newer cars don't even have dip sticks to check the fluid. The car has to be taken to a shop and put on a hoist to check the transmission fluid. This means that a lot of times the transmission fluid gets neglected and can lead to transmission failure. A lot of the chain quick lube shops do not check your transmission fluid when you take it in for an oil change because of no dip stick. If you do use these quick lube shops for your oil changes, be sure to have your transmission fluid checked at least once a year. Most repair shops don't have the equipment to perform internal repairs on transmissions. These types of repairs require OE style scan tools specific for your make and model. This means that they don't have an accurate way to scan the data and review it to determine the problem with your transmission. At Sallas Auto repair, we have the tools and experience necessary to provide transmission service and repair. We know what to do to keep it running properly. We also offer our 24,000 mile/2 year warranty on all transmission service repairs or replacement. Some replacements may even have longer warranties. The engine is the heart and soul of a vehicle. You can help keep your engine in good shape with regular preventative maintenance, but if you have an engine problem, it might be too late. Many car owners think that once their engine goes, it's time to look for a new vehicle. There are alternatives -- you may be able to invest in engine replacement if you do not need a new vehicle. The best thing to do is to weigh out your options. If the rest of your vehicle is in good repair, it may be less expensive to invest in engine replacement. At Sallas Auto Repair, we will give you an honest estimate of the best option for your vehicle so that you can make the decision that is right for you and your family. Stop by Sallas Auto Repair to learn if engine replacement is the right solution for you. If you do decide to move forward with engine replacement, the experts at Sallas Auto Repair have the experience and know-how to replace your engine and get your car back in working order. Our skilled mechanics are ASE certified. We have the tools and advanced equipment needed to replace your engine. Schedule an appointment to discuss engine replacement today!